//I bought "LCD-10000U" of "CENTURY". //I'm using on "Windows7 64bit" & "Bootcamp" & "iMac27inch". //There is no trouble with included driver of Display Link. //1.It worked without trouble on Bootcamp. //2.I could watch video on it. I tried to watch youtube and there is no trouble. //3.It worked only one USB port. It didn't need auxiliary power supply. //4.It turned off when main monitor(iMac) turned off. //5.Frame is thin. 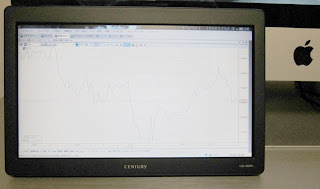 The frame of photo stand which has monitor function is thick. //1.The image quality is not good. //2.The viewing angle is narrow. //3.I can't explain in English. In Japanese, "GIRA BUTSU" monitor. //I think that it is a good sub monitor if you don't request high image quality.